DeMarini baseball bats are the top choice for many players across the nation because of their dedication to high-level performance at all levels of competition. For the 2018 season, the Uprising was created with younger players who want to develop their game in mind. Masterfully crafted out of DeMarini's DX1 alloy, this one-piece big barrel bat delivers high strength performance with sleek cosmetics. On the end, the IonD end cap helps reduce unnecessary weight towards the end of the barrel to help increase bat speed with a lighter swing weight. The best part? 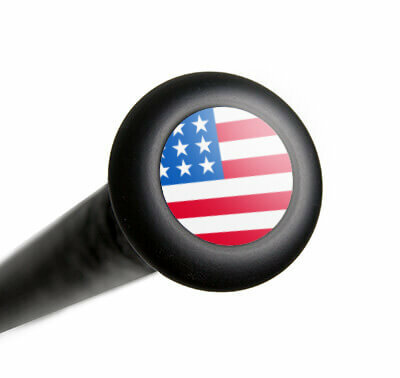 This Uprising baseball bat is backed by a full one (1) year manufacturer's warranty. DeMarini: Choose Innovation. Choose Power. Choose Speed! This 2018 DeMarini Uprising USA Baseball Bat (WTDXUPL) features a drop 10 length to weight ratio, a 2 1/2-inch barrel diameter, and the new USA baseball (USABat) certification. With that new stamp, this model is approved for play in AABC, Babe Ruth, Cal Ripken, Dixie Youth, Little League, and Pony. Rise in the ranks and pick up one of these DeMarini baseball bats today with free shipping. Don't forget, with our 24/7 customer service, we'll be here for you from click to hit! Pros: With the new standards forcing smaller kids to use heavier and longer bats than they need this bat surprised me. The balanced swing really showed true and my son had a good level swing and made great contact with this bat the first time we used it. The only thing I added was a knobcuff to make it feel natural to choke up on the bat. Cons: Pop is about 10-15 feet shorter than an old 1.15 bat but I believe all USA bats will be this way. Pros: The review on this as a coach pitch bat is inaccurate. Spoke directly with DeMarini and they assured me it is good for kid pitch. Cons: No pop and sting on miss hits. Recently bought an axe as a second bat and either it has alot more pop or this demarini is dead, and I tested this with me hitting off of a tee not my son after I saw how much of a difference the origin had in pop off of his swings. There are better bats out there in this price range. Have a question about the 2018 DeMarini Uprising -10 Youth Big Barrel USA Baseball Bat: WTDXUPL? Ask our team of experts and they will respond within 24 hours. 2 1/2" bats are not approved for PONY Baseball, only 2 1/4" and 2 5/8." Under the USA standards, PONY will allow any barrel size up to 2 5/8" in diameter, so the 2 1/2" diameter of the 2018 DeMarini Uprising -10 Junior Big Barrel USA Baseball Bat: WTDXUPL would be legal. Is this bat approved for PONY 2018 with the USABAT emblem? The 2018 DeMarini Uprising -10 Junior Big Barrel USA Baseball Bat (WTDXUPL) bat is Pony League approved for 2018. I noticed on the DeMarini website this bat comes in a 27 inch 17 oz version. Do you know if Just Bats will be carrying this size? Also do you have any information on the 27/17's static weight? I'm not showing any indication that JustBats.com will be carrying that size, but that doesn't necessarily mean that we won't if they make that size. The 2018 DeMarini Uprising -10 Junior Big Barrel USA Baseball Bat: WTDXUPL has been weighing about half an ounce heavier than the listed weight, so a 27/17 would weigh right around 17.5 ounces. I have not seen many USA 2 1/2" barrel bats out yet. Are there more to come? The 2018 DeMarini Uprising -10 Youth Big Barrel USA Baseball Bat: WTDXUPL is the only USA bat with a 2 1/2" barrel diameter (coach pitch bat). At this time we are not aware of any additional models being made in the 2 1/2" barrel diameter. I'm confused by the video for this bat, being contradictory of what I have read elsewhere. Would this bat be ok for 10U kid pitch or is it really 8U and under? The 2018 DeMarini Uprising -10 Youth Big Barrel USA Baseball Bat: WTDXUPL was originally labelled as a Junior Big Barrel bat meaning it would have been better served for players between the ages of 6-8. The classification of this bat has since changed to "Youth Big Barrel" meaning this designation would be a bat best served for players between the ages of 6-12. My son is 6, 4'4", and 50lbs. I can't decide between the 518 Omaha slugger or the DeMarini Uprising. What's your opinion? Thank you. I would recommend the 2018 DeMarini Uprising -10 Youth Big Barrel USA Baseball Bat: WTDXUPL if your player is in a league where velocities do not exceed 40 mph. I would recommend the 2018 Louisville Slugger Omaha 518 -10 USA Baseball Bat: WTLUBO518B10 if your player is in a league with velocities higher than 40 mph. My son is 7 years old, 44 inches, 62 lbs and plays coach pitch. Which size DeMarini would you recommend? At your player's age and size, I would suggest the smallest option of the 2018 DeMarini Uprising -10 Youth Big Barrel USA Baseball Bat: WTDXUPL, which would be 28" 18 oz. My son is 9 and 1/2, he weighs 70 lbs and is 56 inches. What size bat should I purchase from your company? He plays kid-pitch with speeds up to 60 mph. Based on your player's specifications, I would recommend the 29" 19oz version on either the 2018 DeMarini Uprising -10 Youth Big Barrel USA Baseball Bat: WTDXUPL or the 2018 DeMarini Voodoo One -10 USA Baseball Bat: WTDXUO2. My son is entering his first year of kid pitch. He is 8, 51 inches, and around 60 lbs. I'm wanting to make sure we get the right size, but also wondering what the best budget friendly bat would be. Thanks. Based on your sons height and weight the 28"/18 ounce 2018 DeMarini Uprising -10 Youth Big Barrel USA Baseball Bat: WTDXUPL would be a great option for him. My son is 6yrs old, weighs 47 pounds and plays coach pitch. What size do you recommend? Has to be usa approved. Based on your player's specifications, I would recommend either a 27" bat. Unfortunately, the smallest this 2018 DeMarini Uprising -10 Youth Big Barrel USA Baseball Bat: WTDXUPL is manufactured in is a 28" model. My boy is 12, is this a good bat for him to use? I purchased a Easton and he already put a dent in it. While the 2018 DeMarini Uprising -10 Youth Big Barrel USA Baseball Bat: WTDXUPL is a quality bat, the bat I would actually recommend for a 12 year would be the hybrid constructed 2018 DeMarini Voodoo -10 USA Baseball Bat: WTDXUD2. My son is 9 years old. He weighs 78 pounds and is 55 inches tall, would you recommend this bat for him? The 2018 DeMarini Uprising -10 Youth Big Barrel USA Baseball Bat: WTDXUPL would be a great option for your player. Based on his height and weight, I would suggest the 29" 19 oz. size. My son is 10 years old. He weighs 115 pounds and he is 4'5". What size bat does he need? We would recommend a 30" length for his height and weight. My son is 9 years old, 4'11" tall and weight is approx. 100 lbs. He is currently playing Pony league mustang division. What size bat would you recommend? Based on your son's height and weight, we would recommend getting the 2018 DeMarini Uprising -10 Youth Big Barrel USA Baseball Bat: WTDXUPL in a 30 inch model. My son is 6 and 3'9". What's a good size for him? Per your son's height and age, we would recommend getting the 2018 DeMarini Uprising -10 Youth Big Barrel USA Baseball Bat: WTDXUPL in a 27 inch model. 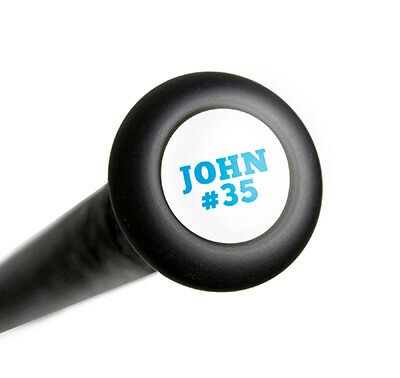 It says that this bat is approved for the Dixie Youth league. Does that mean it has a 2 5/8" barrel? I believe that is what our kids need to use. Bats that meet the new USA certification will feature a USA stamp and will have a barrel diameter that is between 2 1/4" and 2 5/8". This 2018 DeMarini Uprising -10 Youth Big Barrel USA Baseball Bat (WTDXUPL) has a 2 1/2" barrel diameter and will feature the USA stamp required by the Dixie Youth league. The 2018 DeMarini Uprising -10 Youth Big Barrel USA Baseball Bat: WTDXUPL will come in about 1/2 ounce heavier than the listed weight. Is this bat approved for the Cal Ripken League and is it good for 8U pitching machine? Yes, the 2018 DeMarini Uprising -10 Youth Big Barrel USA Baseball Bat: WTDXUPL is approved for Cal Ripken League and would work for machine pitch. My son is 13, 5ft, and 89lbs and he can not handle any bat heavier than -10. At least the -5 Easton S350 was too heavy for him. Is this a good recommendation? The 2018 DeMarini Uprising -10 Youth Big Barrel USA Baseball Bat: WTDXUPL would be geared to younger players, 8-9 year olds. You may want to look into a -8 for your player, as once he gets to high school level play, he will be required to swing a BBCOR (-3) option. However, if you would like to stay with a -10, the 2018 DeMarini Voodoo -10 USA Baseball Bat: WTDXUD2 would be a better option for your player. I would just like to know if this bat is approved for JBO league play? Right now all I've ever seen used is the 1.15 bats. According to the Junior Baseball Organization website, they allow BBCOR, 1.15 USSSA, and USA certified bats. You may want to double check with your coach for more clarification, but it seems that you can use any bat as long as it has one of those certification stamps on it. What is the difference between this bat and the DeMarini Voodoo? Although both of these bats will have a -10 length to weight ratio and USA certification, these models will feature a different design. The 2018 DeMarini Uprising -10 Youth Big Barrel USA Baseball Bat (WTDXUPL) is a one-piece, aluminum bat with a 2 1/2" barrel diameter. The 2018 DeMarini Voodoo -10 USA Baseball Bat (WTDXUD2) is a two-piece hybrid (aluminum barrel and composite handle) and features the larger 2 5/8" barrel diameter. Besides the -10 vs the -11 on the 2019 models is there actually a 1 oz difference or are they reevaluating by swing MOI and they are essentially the same bats? Other than the weight of the bats, the 2019 -10 vs -11 are going to be the same models. The 2018 DeMarini Uprising -10 Youth Big Barrel USA Baseball Bat: WTDXUPL will be a 2018 USA model. I have 2 boys in PONY league age 12 and 14. Both about 5’3” and 130 lbs. What bat would you recommend they use? For these ages, you would most likely want to move them into a 2 5/8" barrel bat, as opposed to the 2 1/2" barrel featured on the DeMarini Uprising -10 Youth Big Barrel USA Baseball Bat: WTDXUPL. For the 12 year old, I would suggest the DeMarini Voodoo -10 USA Baseball Bat: WTDXUD2, although you'd want to move him up to a -8 if he can swing a bat that heavy. For the 14 year old, I would suggest a -5 bat, such as the DeMarini Voodoo -5 USA Baseball Bat: WTDXUD5. Given your player's specifications, I would recommend a 28" model that is (-10) 18 ounces. This is a generic recommendation though.